Skype is one of the most reliable VoIP (Voice over Internet Protocol) service that allows users to make telephone calls over the Internet to local and international global destinations. Even though calls to other Skype users who are online are free of charge, calls to fixed phone lines, landlines and cell phones is chargable, although the rate of fee is comparatively cheaper than conventional routed calls. Now there is a chance to receive free Skype Credit voucher for 30 minutes free SkypeOut calls to any country or destination. All Skype users need to do to receive the Skype voucher is to complete a short survey with just 5 questions, and takes less than 1 minutes to complete. 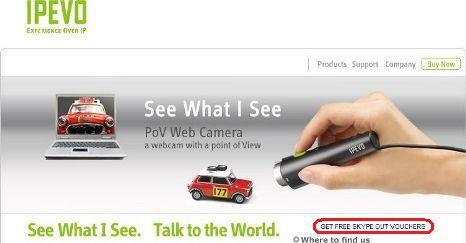 To complete the survey, go to IPEVO website, and then click on the GET FREE SKYPE OUT VOUCHERS link. Enter your email address at the end of the survey, and the free 30 Skype minutes voucher will be sent within 24 hours. The Skype voucher must be redeemed against user Skype account before June 20th, 2008, else the voucher will expire.